10-clip wire Mobile attaching x10 double-sided cutout letters in the same typeface and Indian red background as was used on the cover of Dada 1, issued by the original Dadaists of 1916 at Cabaret Voltire, suspended freely from a single wire . 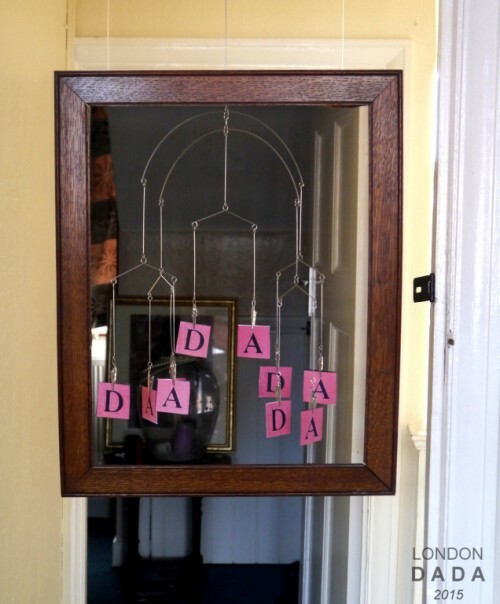 The x5 D & x5 A letters are suspended uniformly from a turn-of-the-century oak picture frame and hang and move randomly within the static frame which is suspended by 2 translucent nylon cords from above. First-ever use of a mobile hung within a picture frame. The in-frame mobile in motion spells out the word D A D A randomly in 10 to the power of 10 possible combinations ( 10 billion ) and is conceived to act as a magical Dadaistic prayer flag – continually transmitting Dada to all points of the compass, to all corners of the world.